If you aren’t sure what I’m talking about, a Paradigm is a set of roles that your party takes on during a battle. Each character in Final Fantasy XIII starts with three different roles they can use – there are six in total, and are the typical roles you’d imagine in an RPG. So an example Paradigm is called “Relentless Assault” and consists of one heavy damage dealer (the Commando role) and two magic users (the Ravager role). You can (and need to) switch Paradigms mid-battle, and having all this stuff setup beforehand and being able to efficiently change Paradigms is a big part of the game’s strategy. If you’re getting hammered, it’s time to switch to a Paradigm that contains a medic (or two). It sounds simple, but there are a lot of combinations to choose from, and the game only allows 6 combinations to be setup at any one time. Each character only starts with three available roles, so figuring out what party members are needed adds another layer of complexity. Sure, it’s not the most complicated mechanism in the world, but there’s definitely decisions to be made, and I often find myself wishing I had more options in the middle of a battle. Okay, let’s talk about the problem. You’ve got six characters, and each of them has a different set of roles they can use. So when you swap one character out for another one, all of your preset Paradigms are removed. This makes sense, because at least some of your Paradigms won’t be possible anymore. You could make an argument that the game should preserve any that could be still valid, but whatever. However, since each character in the game has their own strong point, if you have a set of three characters in the game, you’re probably always going to use a similar set of Paradigms with those three. So, what the game should do is recall the Paradigm Deck that was setup the last time those three characters were together. For example, in my game at the moment I’m rolling with Fang, Lightning, and Vanille. 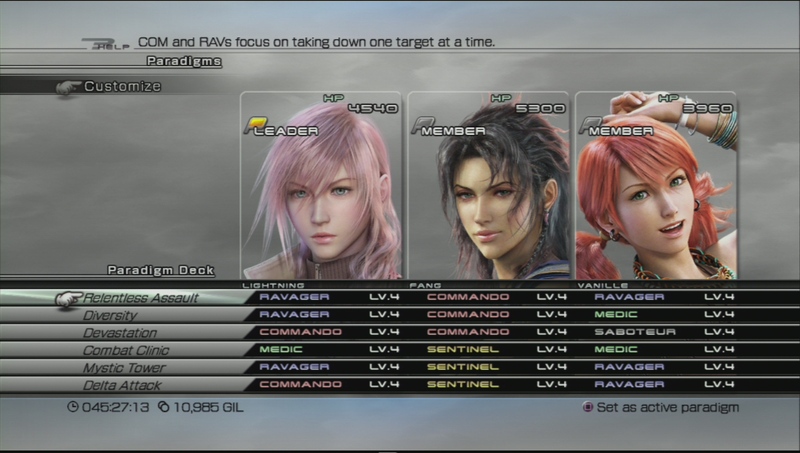 I’m using Fang in the Commando or Sentinel roles, Lightning as Commando or Ravager, and Vanille as Ravager or Medic. Occasionally, I might want to swap out Fang for Snow. But every time I have Fang, Lightning, and Vanille in the same party, I basically want to have the same Paradigms setup. Unfortunately, the game doesn’t remember what my Paradigms were and I have to go about setting them up again each time. For me, it’s easy for RPGs to border on being tedious with all the fiddling that has to go on in the various menus. It’s a double-edged sword I suppose, because managing my characters is part of what I love about the genre. Having to go back and re-setup Paradigms all the time though, is not fun at all, and it feels a little bit like backtracking. As a result, I avoid changing characters as much as possible – and that’s too bad, considering I still spend a lot of time upgrading each one’s stats and weapons. Honestly, for a game that I’ve spent 45 hours on so far, having to re-setup my Paradigm Deck when switching characters probably shouldn’t be that big of a deal. However, the fact remains that when I’m using the same three characters, I’m probably going to have a similar set of Paradigms set up, so there’s no reason the game couldn’t remember that and save me a little bit of work. Did you notice the same thing about Paradigms in Final Fantasy XIII? Or maybe you think it’s better to force the player into making new decisions each time? Let’s discuss in the comments! This entry was posted in Console, Role Playing and tagged final fantasy, game usability, menu usability, ps3, rpg, ui, ux by mark d. Bookmark the permalink. Paradigms go in the face of all that an RPG is invested on representing, and that is logic and reasoning. Razor sharp lightning fast responses tailored from a select few options are more of an action based feature, and when adapted to a menu format like Xenoblade after this have an issue wherein all enemies are approached nearly the same way since traditional hitboxes aren’t something you harness to your opponent’s undoing like in an action game; Enemies and their attacks embody a set of ‘statistics’ rather than physical properties and this leads to every enemy being a carbon copy of each other with only variations in stats. Dark Souls is this game’s point of comparison. It’s paradoxically an action RPG with opponents you defeat through logic and reasoning, while ironically epitomizing the test of them that the genre is known for. Turn based has it’s place. But it’s meant to facilitate long periods of thought about what’ll happen next. Hi, thanks for the comment! I do like the Paradigm system, but you’re right, it introduces some weird mechanics where you’re trying to select actions as fast as you can from the menu. I probably spent about 40% of my time with the game mashing on the X button. And yeah, I used just a couple of strategies throughout most of the game – which is why it was so irritating that I kept having to reset those couple of important Paradigms. I also agree with FF X being the best combat of the series. Being able to swap in and out characters was so fun – I remember more than one battle where nearly everybody was dead, I just kept swapping out KO’d characters for live ones. Having the whole party die when your leader dies was a way for the game to score really cheap wins, which is stupid. But that said, I still think the Paradigm system brought an interesting strategy to the game, it streamlined combat somewhat, and it was way simpler than the shenanigans that went on in FF XII with gambits (although comparing the combat systems in those two games hardly seems fair). FFXII had it’s problems too, yes. 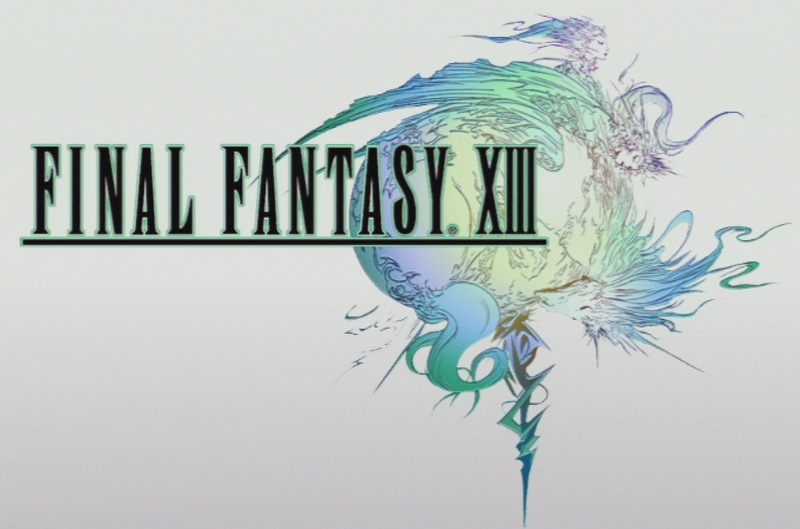 I wish this game wasn’t just a streamlined and simplified FF that vowed to strip it to the bare essentials, but let you expand outwardly from that. I’m ok if the game played closer to FFX or the Midgar sections of FFVII, which it does more poorly than them, and I don’t mind that it streamlines event to even the way it tries and I feel fails to… My problem is that you can’t magnify your adventure by exploring around it.